3) Post a comment on the post to confirm your participation. Article 1. 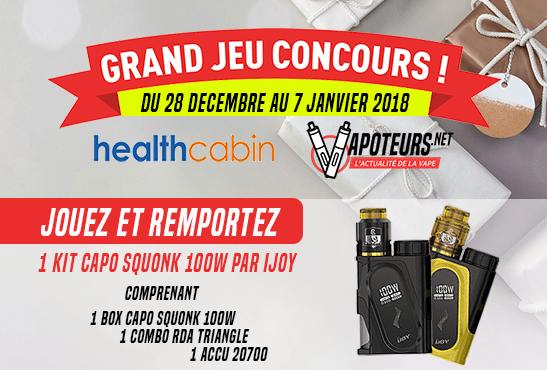 HealthCabin and Vapoteurs.net (Vapelier OLF) are organizing a free game with no obligation to buy the 28 December 2017 au 07 Janvier 2018, entitled " Contest Healthcabin / Vapoteurs.net ». Article 2. This game is open to all natural persons residing in Metropolitan France, Belgium and Switzerland, excluding the leaders of the organizing companies, and members of their respective families living under their roof. Article 3. To participate, simply follow the participation procedure. Article 4. Participation is limited to one entry per person (same name, same address), over the duration of the game. Article 6. The winners will be chosen at the end of the draw, and will receive their prize by mail directly from the company Healthcabin. The list of winners will also be available on www.vapoteurs.net. Article 7. The prizes are neither exchangeable nor negotiable. Article 8. Vapoteurs.net et Healthcabin reserve the right, for any reason, to modify, extend or cancel this game. Article 9. Participation in this game implies the unconditional acceptance of these rules in their entirety. Article 10. Vapoteurs.net et Healthcabin can not be held responsible if, for reasons beyond their control, the game must be wholly or partially postponed, modified or canceled. Article 13. Participation in the game implies the full and unreserved acceptance of the present rules, of its procedures and results.